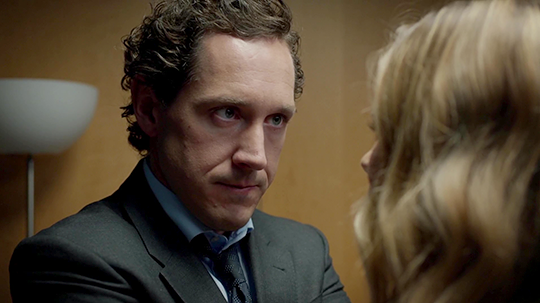 Since late 2014, Brit Marling and Bertie Carvel have starred as characters in antagonistic or otherwise belligerent romantic dynamics, each with devotees and most with hatedoms significant when considered in proportion to audience size. Yet none have been as championed by the bulk of fandom and professional critics as their portrayal of Babylon’s Liz Garvey/Finn Kirkwood, which is the least explicitly canon and has the most limited scope, both in terms of in-universe time and onscreen duration. Why is this so? Based on interviews and social media activity, we can discern major areas of agreement between Marling and Carvel - namely, identification with Inigo Montoya. 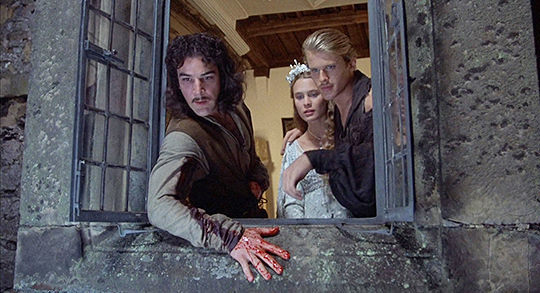 Since none of Babylon's writers are known for romance and The Princess Bride is a highly romantic story, I conclude that Marling and Carvel's chemistry stems from mutual admiration of Montoya. Montoya represents political and, more importantly, epistemological truths that are apparent in the Liz/Finn relationship. In the interest of transparency, the reader should know that I have never fully read nor watched The Princess Bride. I have, however, heard Inigo Montoya's backstory read aloud during one or two Drama classes in 8th grade, a mere seven years ago at time of writing. Meanwhile, since late 2014, I've conducted a close-reading of Babylon that's so close that if Babylon was a grindstone my face would've been sliced off. For the sake of thoroughness, I analyse three important quotes from TPB. For the sake of clarity, they are all the same quote. A small glossary, of sorts: unlike Tumblr-esque misappropriated academic terminology, I avoid contentious words like 'problematic', 'discourse', and 'performative'. In their place, I use 'oopsy daisy', 'yada yada yada', and 'LARP'ing'. I hope that these changes will facilitate civil yada yada yada. So far, Marling has alluded to her childhood obsession with Inigo Montoya in an appearance on The Late Late Show with Craig Ferguson (2013), an interview with the AV Club (2015), and an interview with Glamour (2017). Marling often speaks about the urgent need for representation, which she attempts to fulfill by writing and playing roles that are relatable for women. Her work from 2011-2016 also contains a great deal of intertexuality. Montoya's influence is definitely embedded within her mythos, including Babylon. Meanwhile, Carvel first referenced The Princess Bride in a tweet. Shortly afterwards, he explicitly mentioned Inigo Montoya during the Old Vic's Q&A session, attaching a relevant image. Considering his level of emotional investment in play-acting Luke Skywalker and playing Jonathan Strange, we can infer that a similar process took place with Montoya. In the Late Late Show interview, Marling suggested using krav maga in self-defense against capitalists. In a more incendiary, revolutionary take, Carvel once proclaimed that understanding Eugene O'Neill'sThe Hairy Ape depends on “how much you want to talk about Marxist theory”. Therefore, Inigo Montoya embodies socialism: he rejects his phenomenology-obsessed employer in favour of siding with that guy who's played by Cary Elwes, who represents the working class. However, there's a point where we must acknowledge gender disparity and its implications. Carvel wishes to be Montoya. Meanwhile, Marling wished to marry Montoya. Montoya canonically lacks a love interest, so Marling unfortunately lacks any possible form of representation within his narrative. Speaking to Ferguson, Marling expresses temporal and corporeal confusion as part of disillusionment (“Up until a little bit ago I thought I was gonna marry Inigo Montoya, and then I realised that he's actually on Homeland now and probably married to someone else already”) whereas Carvel’s “I need to be” suggests ongoing belief in Montoya's existence. For Marling, the concept of ‘becoming’ revolved around a domestic role defined by relation to a man. 'Becoming' was eventually shed as a childish aspiration. Yet the end of Montoya’s quest occurs shortly before the end of his existence as a character, compounded by how his narrative is a story within a story. Even a hypothetical sequel would just delay the inevitable. It seems that woman’s fate is longing non-existence ended only by the death of illusion while man’s fate is inescapable permanent self-annihilation. Man and woman are naturally equal in oblivion, though they reach oblivion in different ways. It follows that non-binary people are immortal, but that's beyond the scope of this essay. 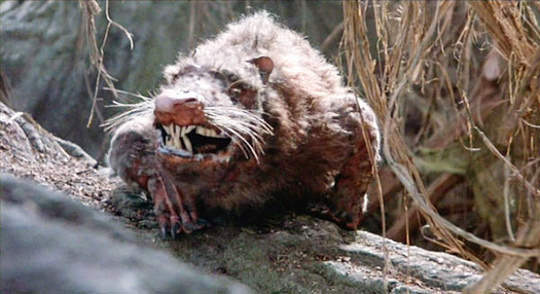 Pictured above is a Rodent Of Unusual Size (ROUS). This is undoubtedly relevant, because Liz and Finn are gigantic rats (GR). Note the similarity between the alphabetization of GR (gigantic rats) and PR (public relations). Indeed, the only major differences between the two concepts are ‘gigantic’ and ‘public’ and ‘relations’ and ‘rats’. So, why do I focus on one specific quote from TPB? Besides the fact that it's the only one I know, thematic resonance mirrors literal repetition which represents thematic resonance. The effect is similar: a solemn, yet tragically amusing declaration of intent. The Liz/Finn relationship intensifies in the second half of the main series. I've selected one quote from each of the three episodes in the second half, to demonstrate the near-perfect equality within their dynamic. Coupled with their Star Wars references and Star Wars' foundation of metaphysical dualism, the nature of Liz/Finn interactions suggests progression towards 'balance' in their environment and, by extension, London itself. Until this episode, Liz has been motivated by LARP'ing social consciousness. Only now do we see her start to care about anyone else, coinciding with parallelism with Montoya (socialism). However, its decisiveness is offset by several factors. Her ambivalence is connoted by the incomplete declaration of her name ('Liz', without 'Garvey'). Rather than deliver an outright threat of bodily harm, she threatens Caroline Carey's career - which is ironic, considering that Caroline is threatening Liz's and Richard Miller's. Does Liz equate bodily wellbeing with career health? Then, instead of announcing Caroline's impending doom, she offers another choice. Parallelism with Montoya occurs as Liz strives for self-actualisation, but ultimately fails to attain it. Nevertheless, it paves the way for future development. Bear in mind that while Richard delivers a threat to Tom in Episode 1, he never says his full name; he doesn't parallel either Liz or Inigo Montoya. Richard has no true connection with Liz. The drama over Richard simply serves as a shadow to a truer fundamental aspect of her character: her relationship with Finn. Throughout Babylon, Finn expresses socialist sympathy through unusual protectiveness over the public sector and disregard for his own pay. Montoya embodies socialism. In Montoya's most pivotal moment, everything that he says is true. His name is Inigo Montoya. His opponent did kill his father. His opponent does die. Therefore, we can infer that everything Finn says is true unless he says otherwise. If he says otherwise, then that must be true, because everything he says is true, because he likes socialism, and socialism is Inigo Montoya, and Inigo Montoya tells the truth, and Bertie Carvel wants to 'be' Inigo Montoya, and Carvel played Finn - or, rather, brought him into being. 'Is' is an interesting word, isn't it? 'Is' is the result of a being having been successfully being. As 'is' is a status, 'is' is also a malleable state of being an unspoken 'to be'. Outside written text, a character's 'is' is brought into being by being by an actor, a being who has been others, could have been others, and will be others. This continuum of past and potential being is concentrated in each being; it is projected as different representations of being, which are influenced by the being's many beings. In this sense of 'is', Finn 'is' Inigo Montoya. Finn declares that he ('I') is the Prime Minister, subordinating his self-identity to a figurative role. This role is crucial for his moral imperative, to the point of implicit self-destruction. “I run things” alludes to the paradigm shift that took place in order for Finn to gain total control, following earlier victimhood. While Finn doesn't mention who Liz killed, the scene in question is Miller's funeral. He utters this quote shortly after he and Liz notice Miller's bereaved family walking past. Obviously, Finn is also motivated by Montoya's desire for revenge. 'Revenge' is a fancy word for 'justice'. Additionally, Finn is more descriptive than Montoya concerning murder, doubtless due to his possible background in journalism or at least English in general. Since Finn always tells the truth (besides when he truthfully doesn't) and Liz functions as his ontological 'opposite', it stands to reason that Liz almost always lies. It's amazing how deeply they share certain traits, like being each other's antithesis. Here two 'divided' selves diverge and converge through a semantic labyrinth, culminating in a transcendental union. Again, Finn doesn't feel the need to repeat his full name. In contrast to the direct resoluteness of Montoya’s quote, Finn communicates sarcasm through hedging ("a bit"), then compensates through hyperbolically strong words ("everything"; "24/7"). Whereas Montoya's line is a declaration of vengeance, Finn's line references a previous death caused by Liz, in which Finn played absolutely no role. Finn implies that Liz 'shagging' Richard led to his death. By doing so, Finn partially 'transfers' the role of Montoya to Liz while retaining delivery of the above threat. What about Liz, herself? Liz and Finn are no longer immediate threats to each other. In terms of parallelism with Montoya, Liz is Montoya's sword. Dangerous. Shiny. Granted, the sword is also lifeless and silent, but so are women whenever they contradict the astute analysis of a male opponent who makes doki doki eyes at them. This scene marks a turning point in Liz/Finn. Together, they 'kill' the miscommunication between them - the same miscommunication that killed Richard, who was the only confirmed father in the Scotland Yard arc. Like any good romance, Liz/Finn begins with dramatically avenging the catalyst for childhood trauma. Liz and Finn are destined to be partners in crime due to their shared convictions. They are soulmates because they both lack complete souls. Liz/Finn is groundbreaking in the sense that one black hole swallowing another black hole surely results in an orgasmic Big Bang that reshapes the fabric of space, time and written rhetorical convention such as using a serial comma at the end of a list of three. But who swallows? Who will get on their knees and swallow that big load of truth? The answer lies in Inigo Montoya. Socialism is inherently social. As socialism, Montoya embodies equal distribution. In Liz/Finn, many things are equally distributed, such as fear and blame. Where we leave them, there's a feeling that many more things will be, like saliva and thirty billion bacteria per batch of saliva. Babylon's pilot closes with Liz's voiceover about open communication in the context of the wider world. No communication could be as open as stating one's name, situation, and intent. Repeatedly. Setting aside their routine deceit and deliberate misdirection, that's exactly what Liz and Finn do as they near the climax of their relationship. Love is a dynamic process - a relationship with relationships. It's far more meaningful to be isolated while surrounded by other people and responsibilities. From Liz/Finn, we can learn that all we need in order to be understood is one person who thoroughly misunderstands us and uses us to kill something, preferably abstract concepts, including self-assurance and certain PR/GR methods.